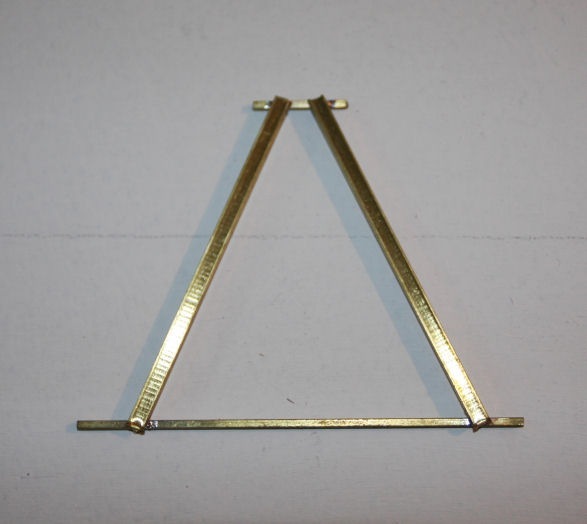 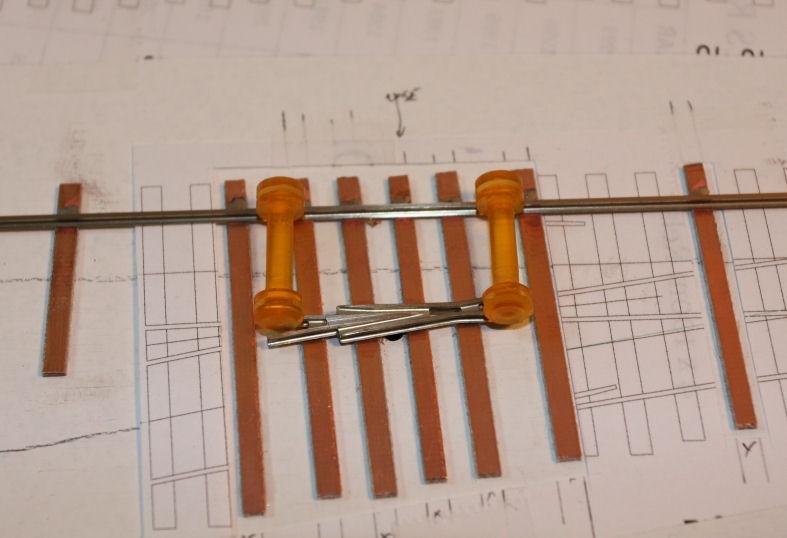 …well, the first solder joint made anyway! 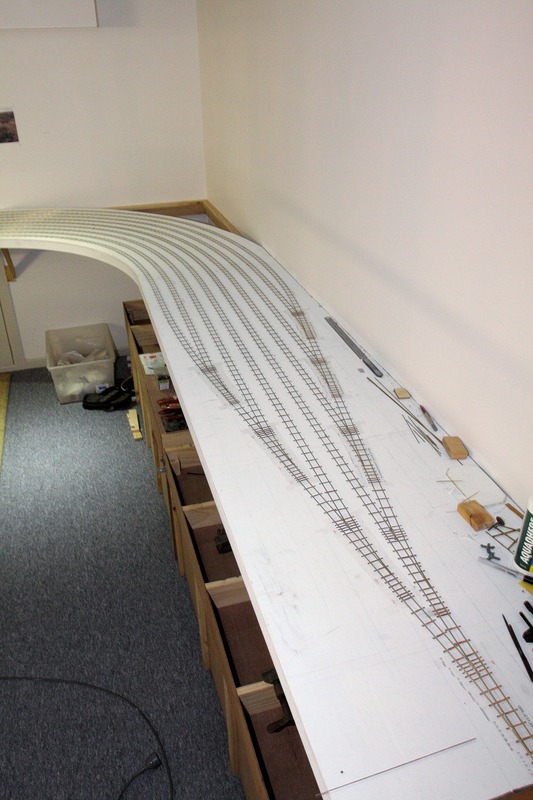 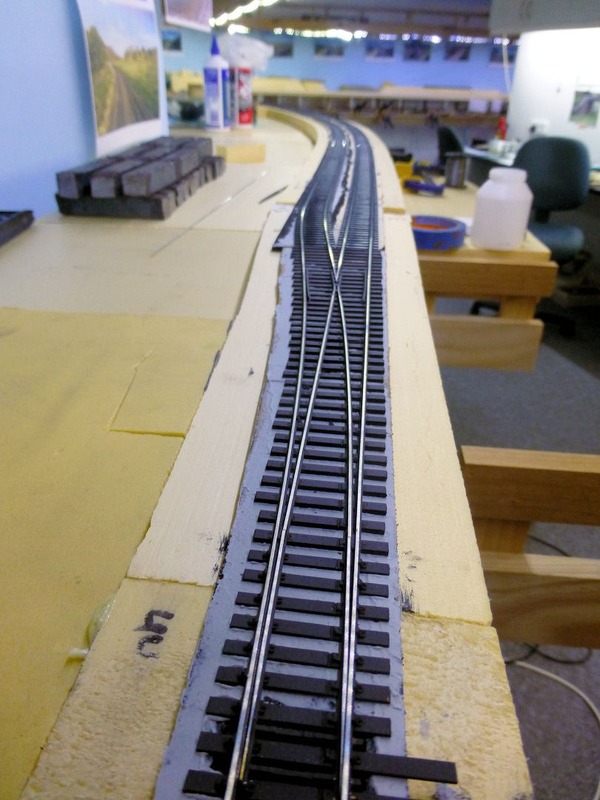 Yesterday, with help from Andrew, I commenced laying the storage yard trackwork. 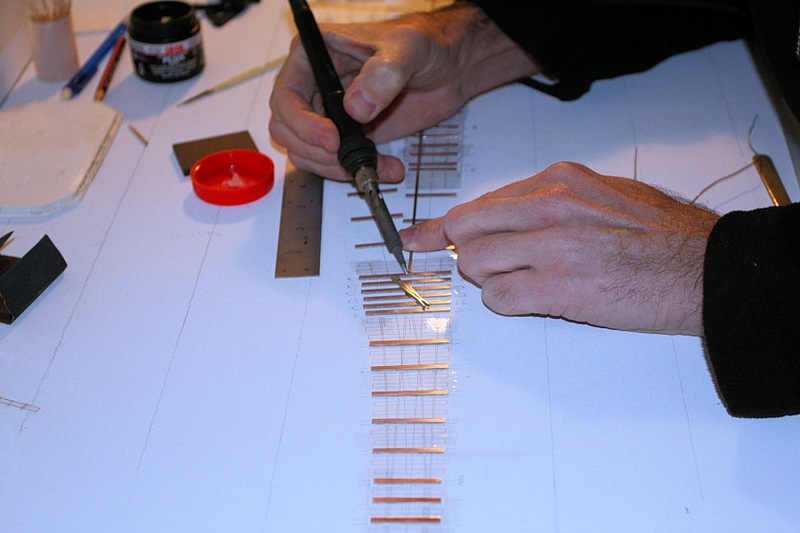 In the time since the last post, I have drawn in track centrelines and have been gluing down PCB sleepers in preparation for rail. 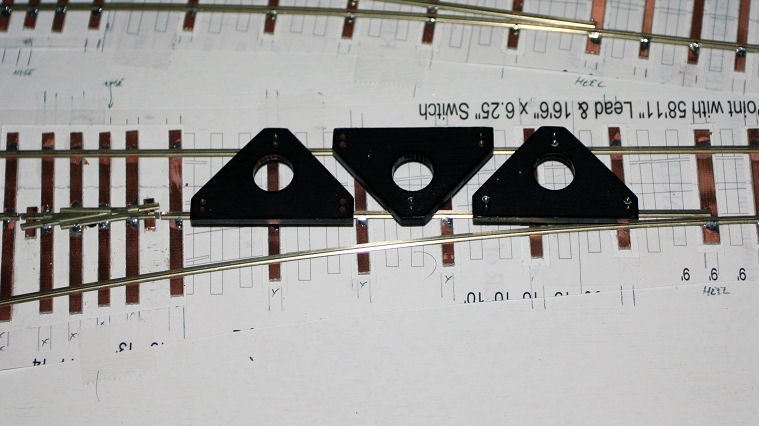 I also assembled two etched frog kits from Proto87 Stores. 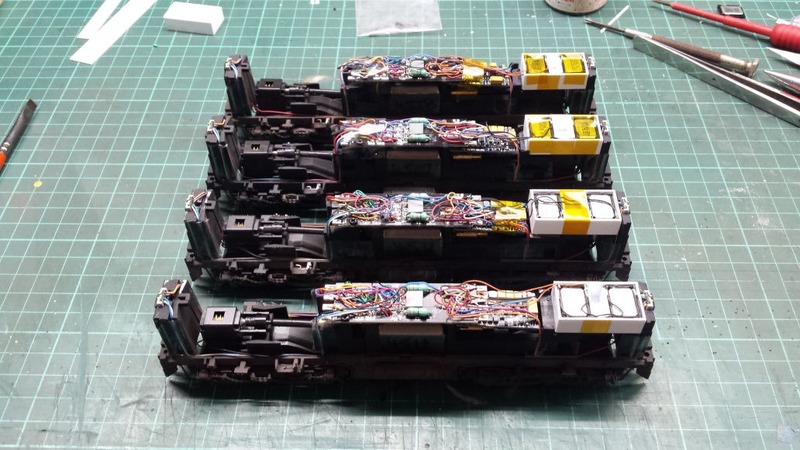 More on these later. 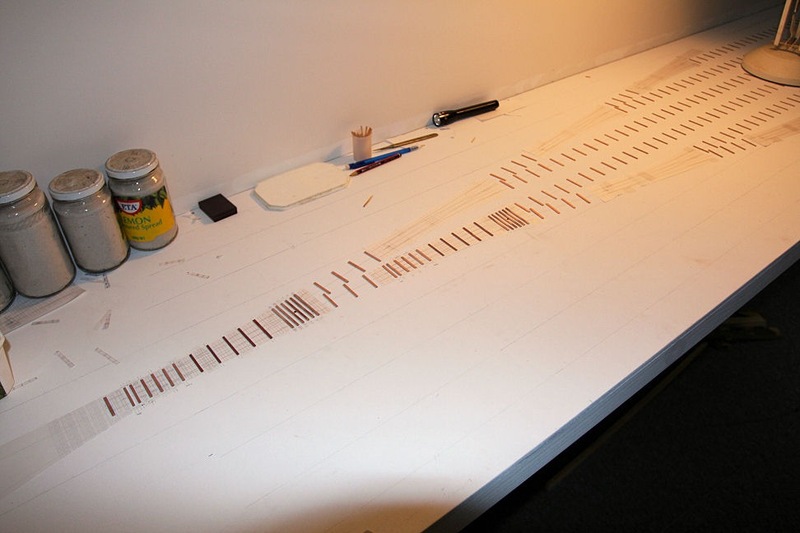 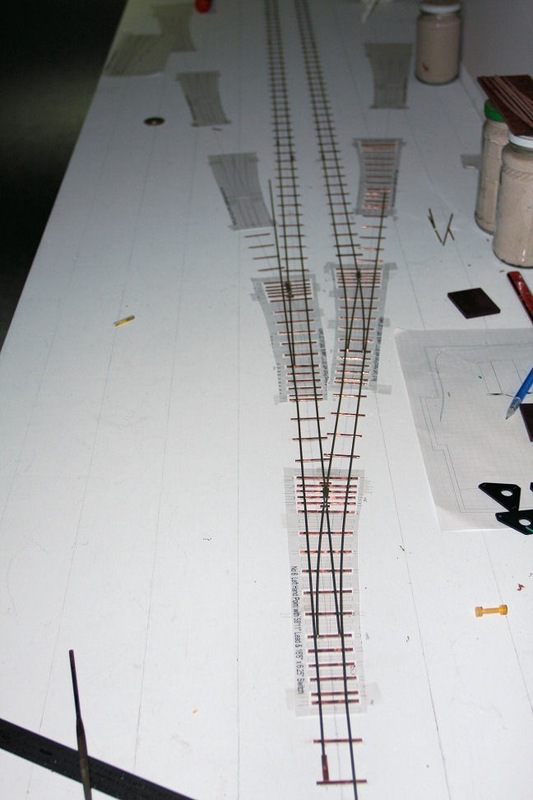 After the centrelines were drawn in, paper templates of NSWGR 1:6 turnouts were taped down in position. 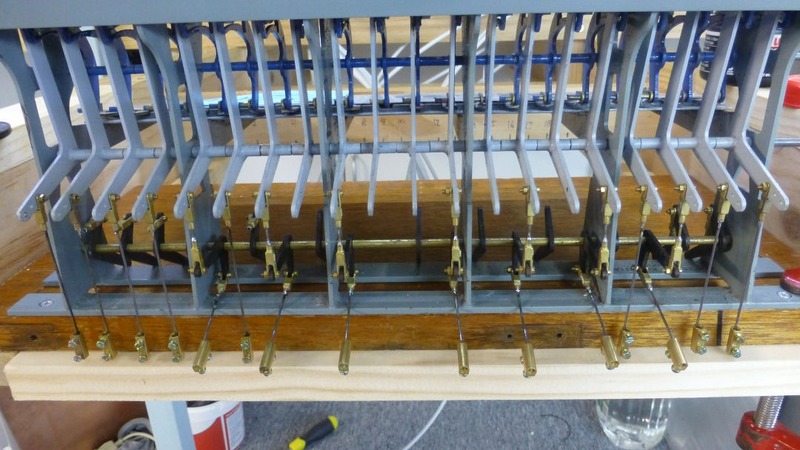 There are a total of 32 turnouts in the storage yards, sixteen for each UP and DOWN yards, eight at each end. 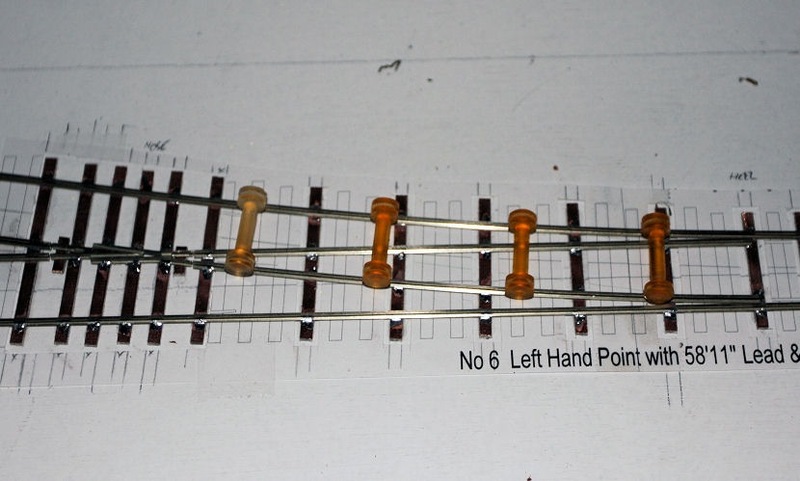 After carefully setting the first eight out for the left hand end of the UP yard, I began gluing down the PCB sleepers. 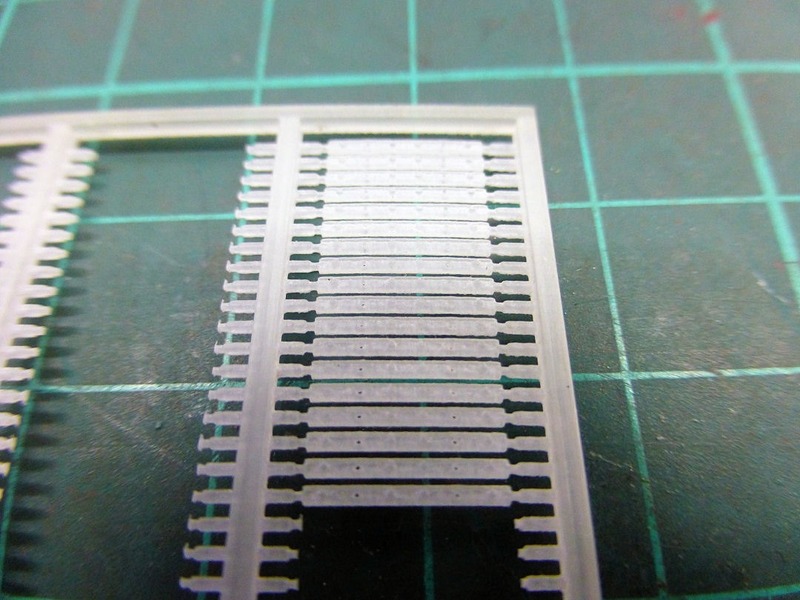 These had been cut by myself from large sheets of 1mm PCB into strips about 200mm long by 3mm wide. 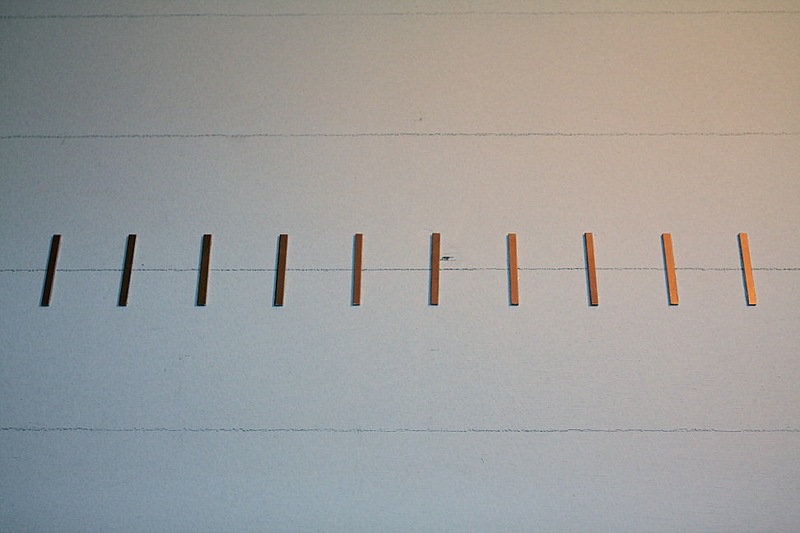 These strips were then cut into short lengths approximately 31mm long. 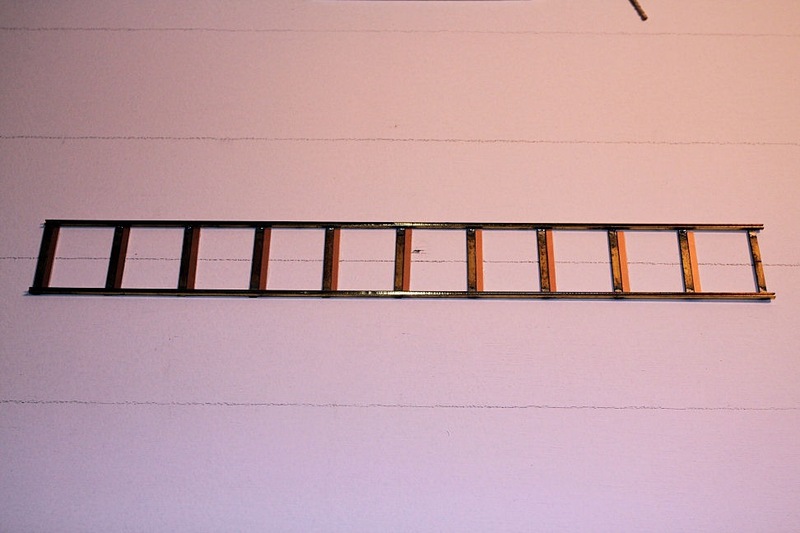 The first batch produced about 400 sleepers out of a 300 x 200mm sheet. 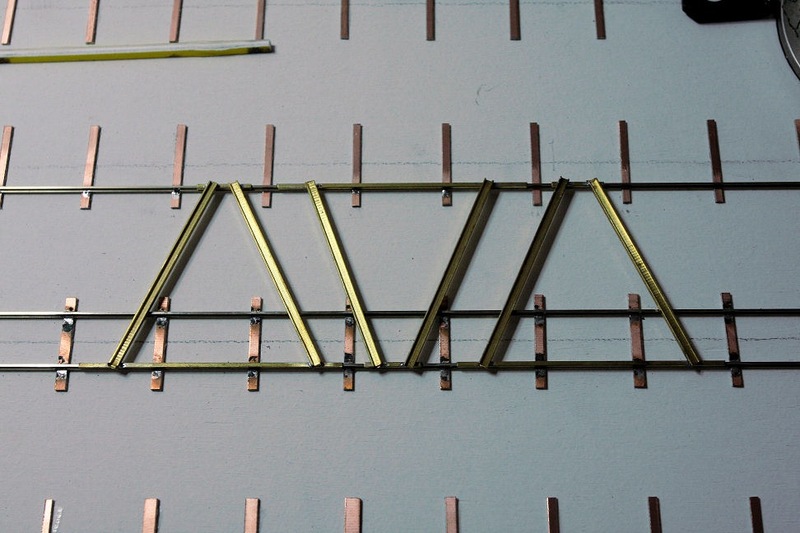 I commenced gluing these down with PVA glue using a jig that I built from brass. 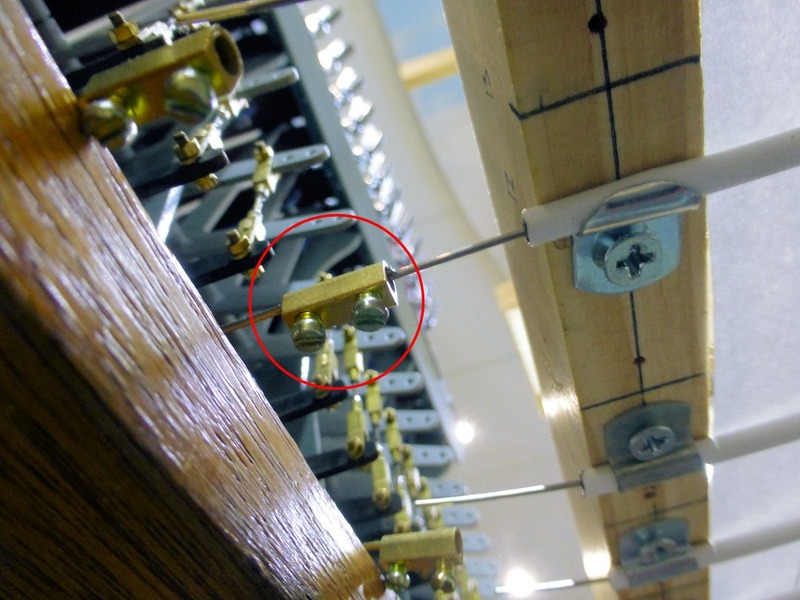 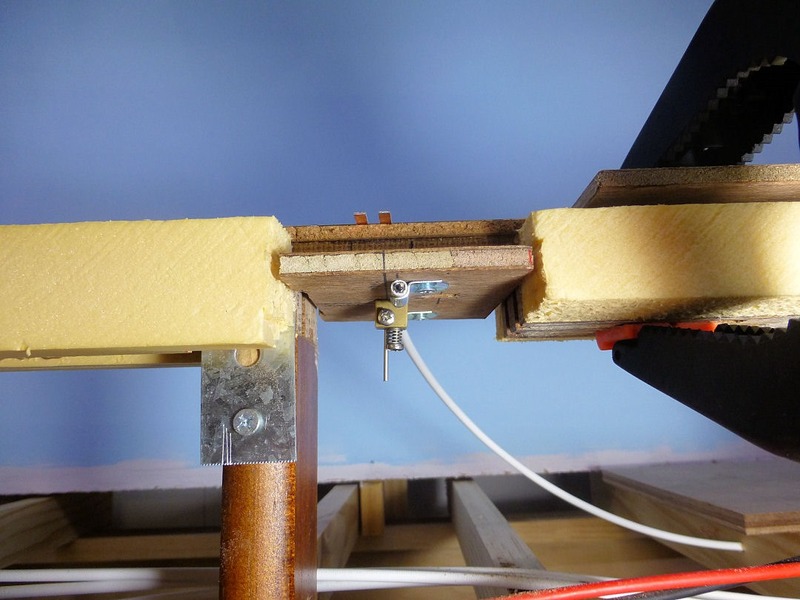 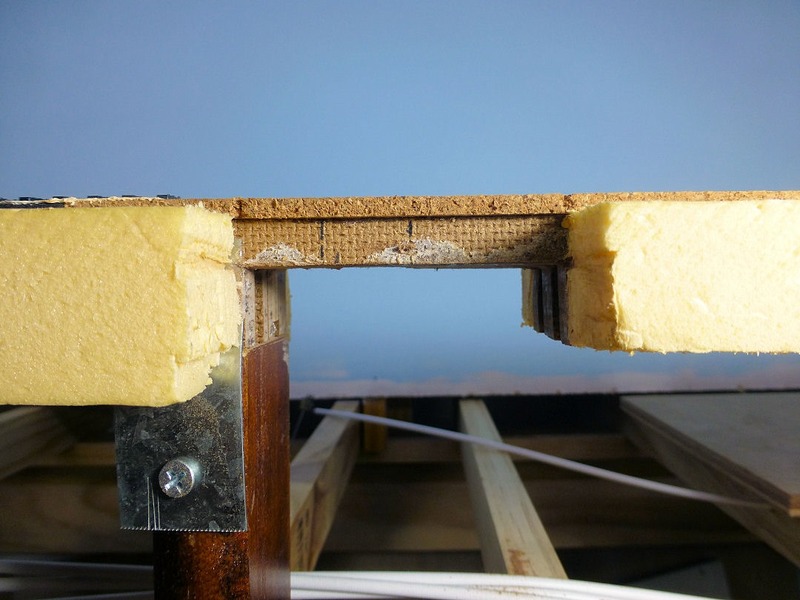 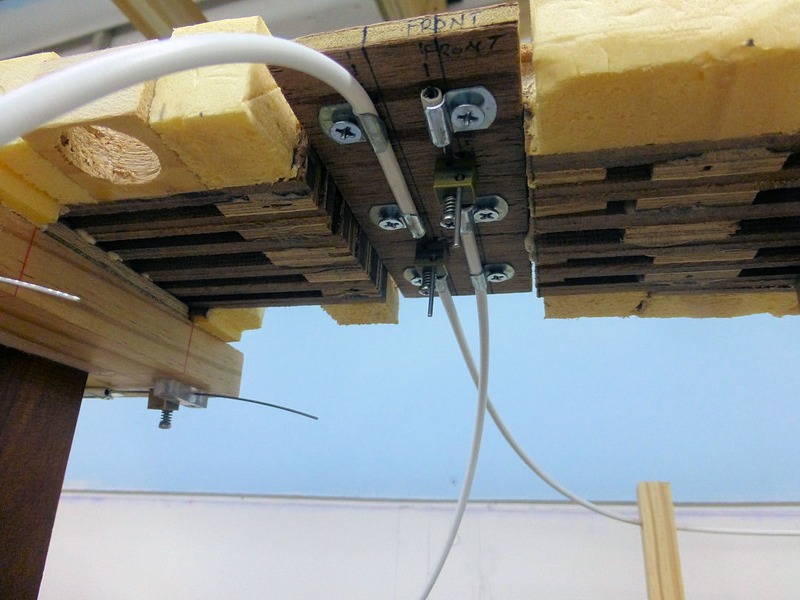 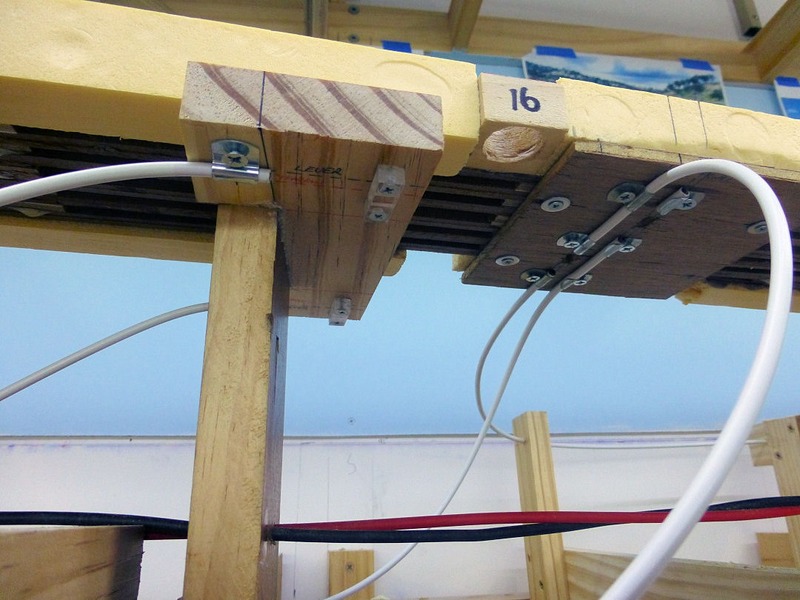 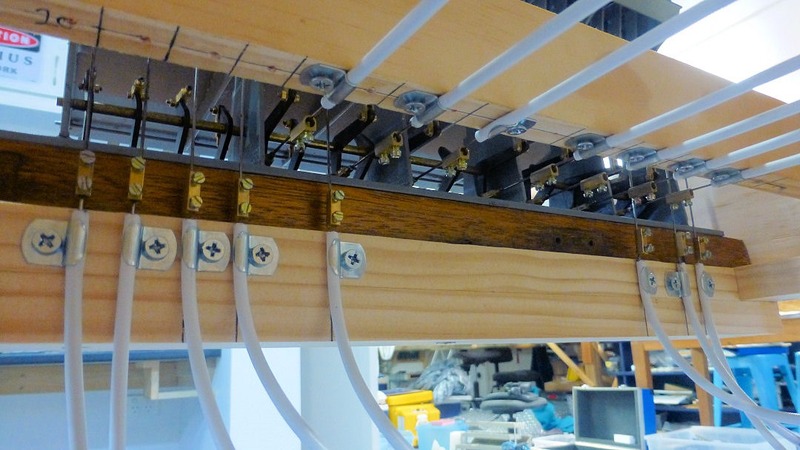 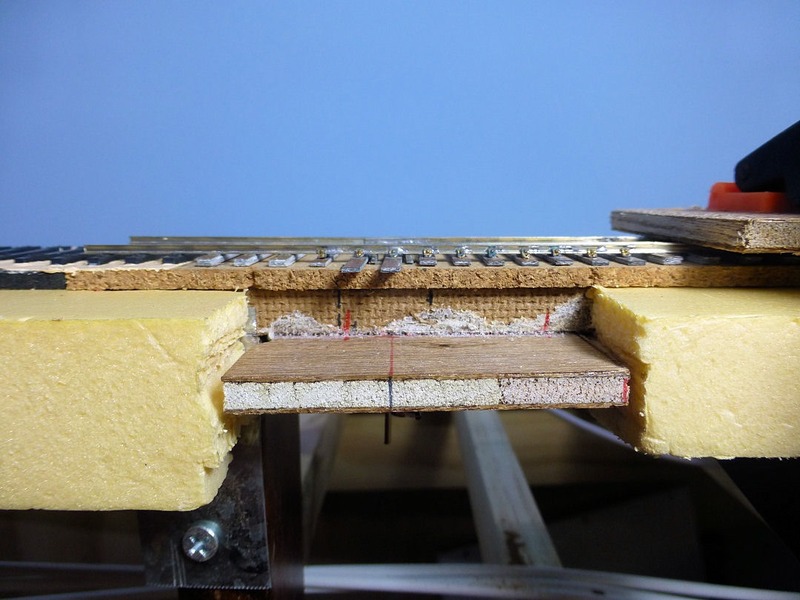 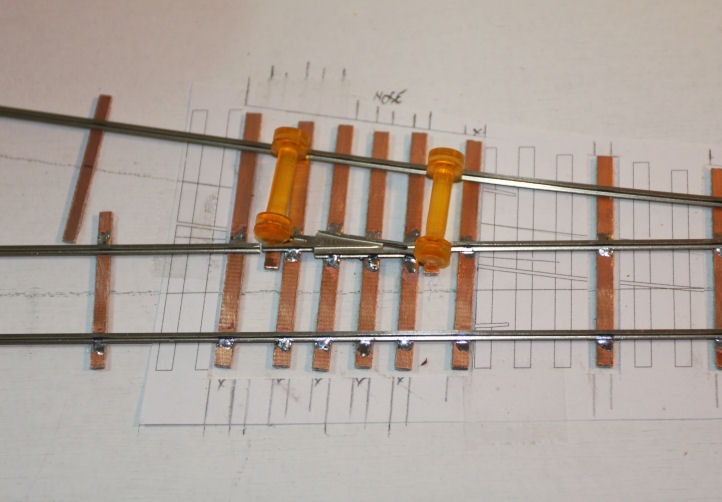 This jig enables ten sleepers to be laid at a time, equally spaced at 30mm intervals. 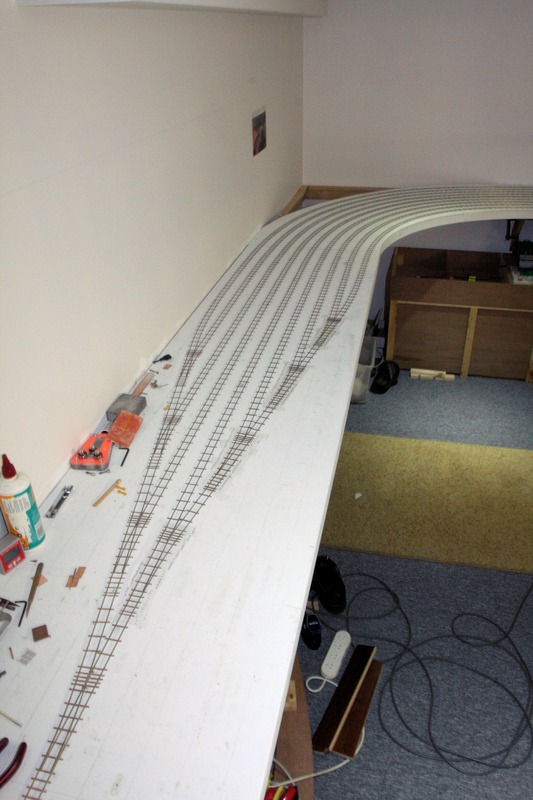 On the first two turnouts that lead into the yard (both on the centre road), I determined where PCB sleepers would be required here as well. 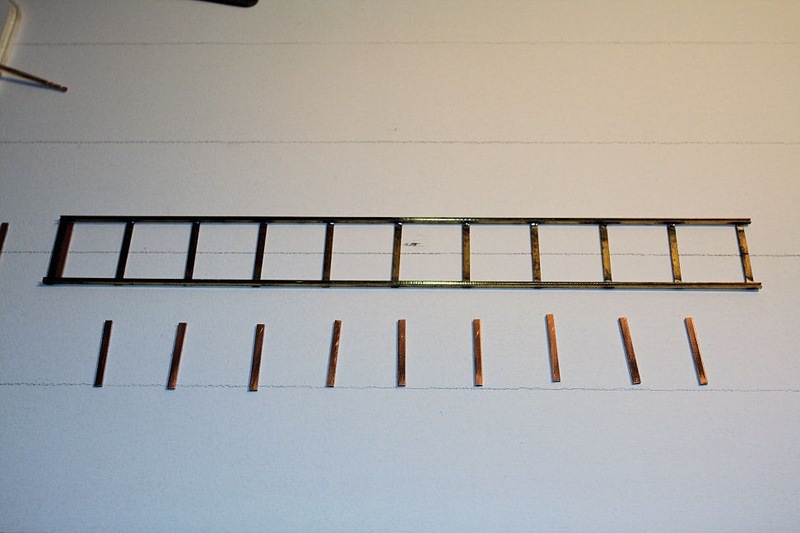 Using a sharp scalpel, I cut out the sections of the template where the PCB sleepers would go, cut these to length, then glued them down. 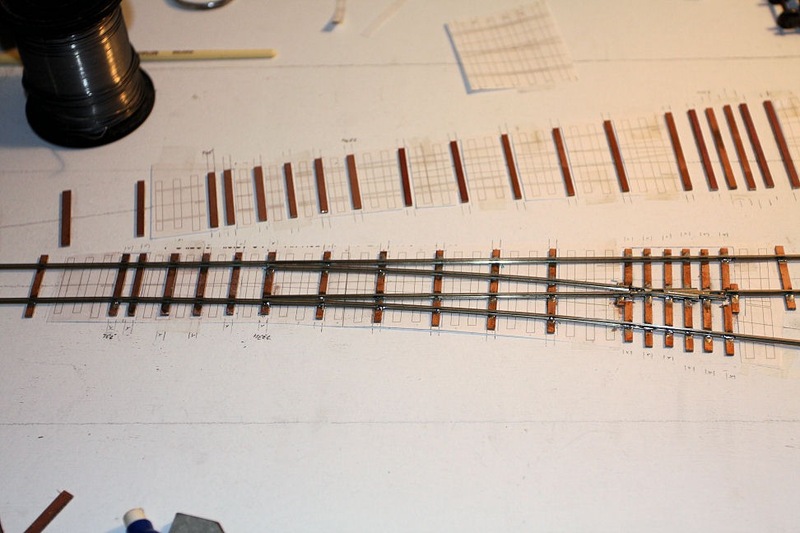 Since I wanted to lay the centre road first, these first two turnouts determined where and how the first sections of rail were laid. 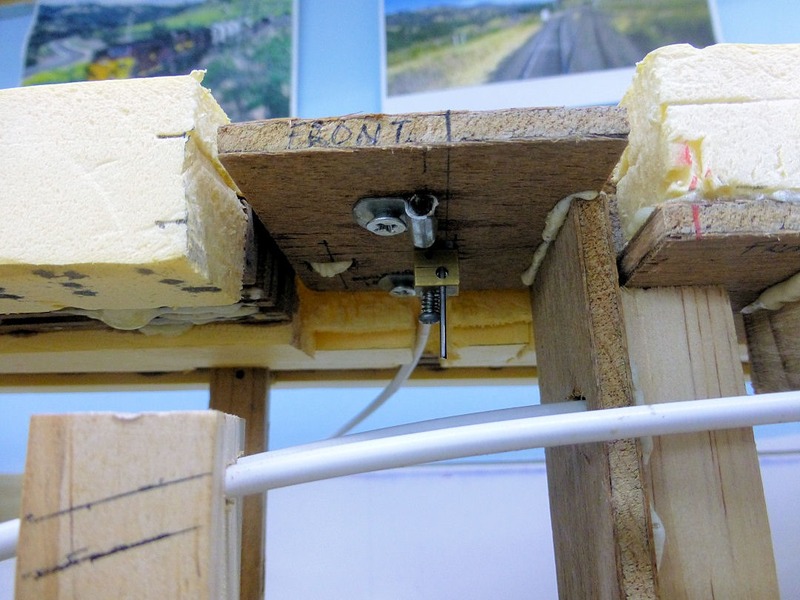 I won’t go into all the nitty gritty of building turnouts, as there have been numerous articles published on the subject. 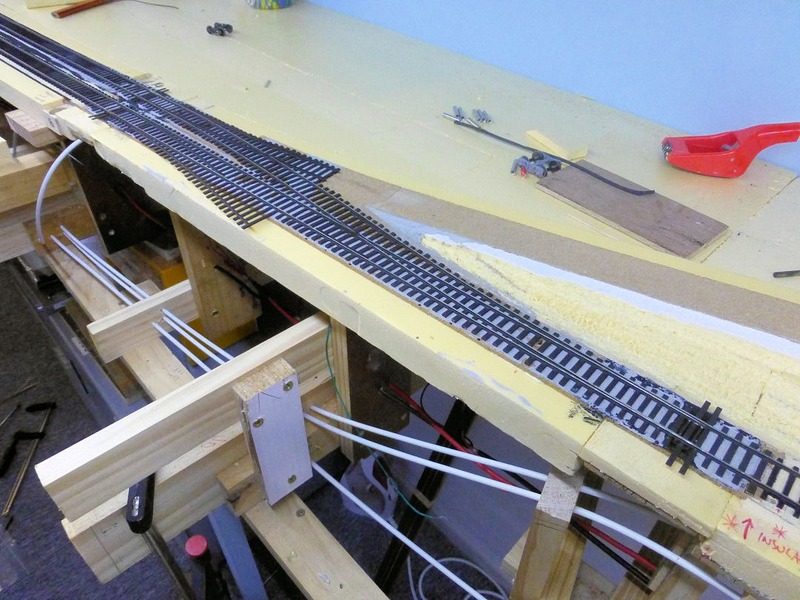 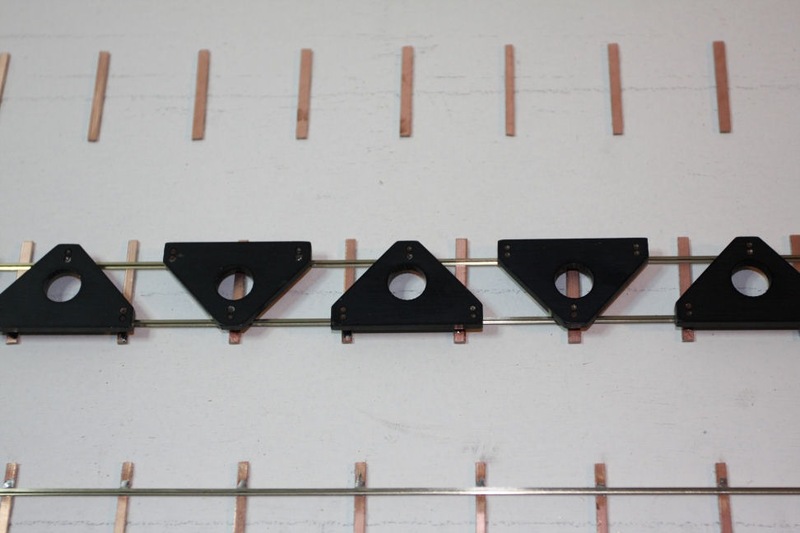 I had decided to build the turnouts in situ because it made it easier to align them all in the yard ‘ladder’, as well as being able to use full lengths of rail rather than building them on the workbench then fitting them in place and then connecting them with many short lengths of rail. 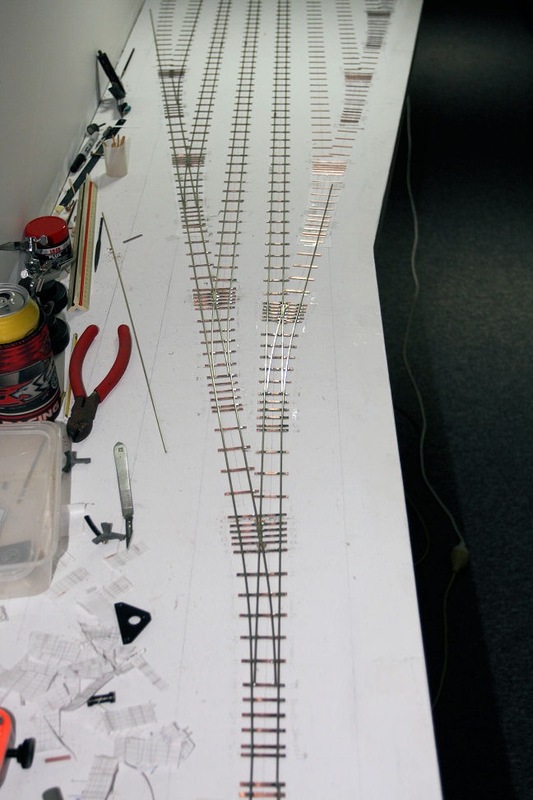 This also minimises the number of joins in the rail. 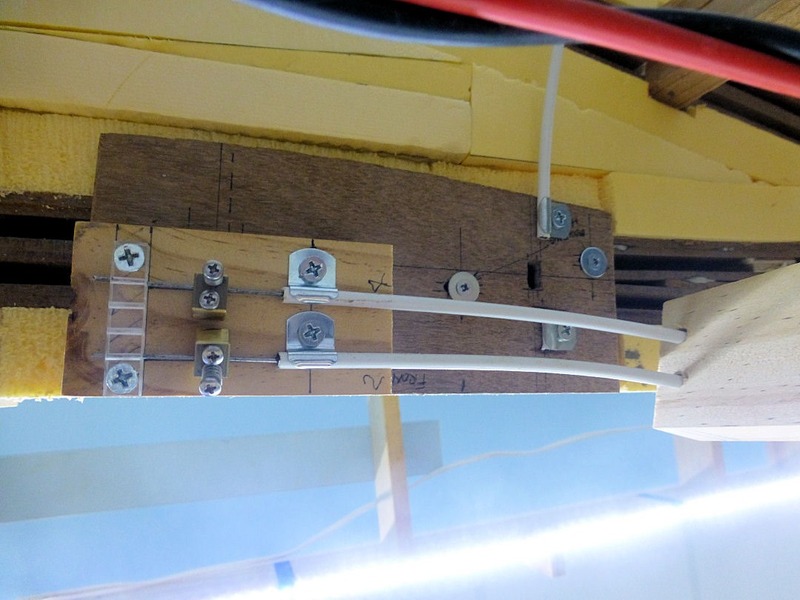 The picture above shows me making the first soldered joint. 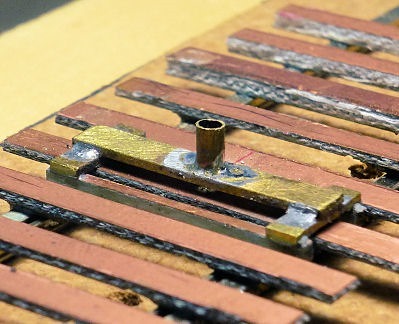 Note the etched frog assembly has not been soldered in place yet. 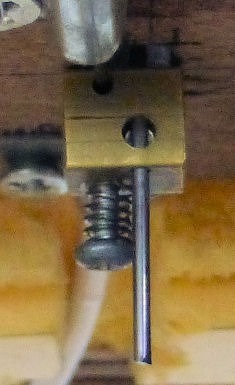 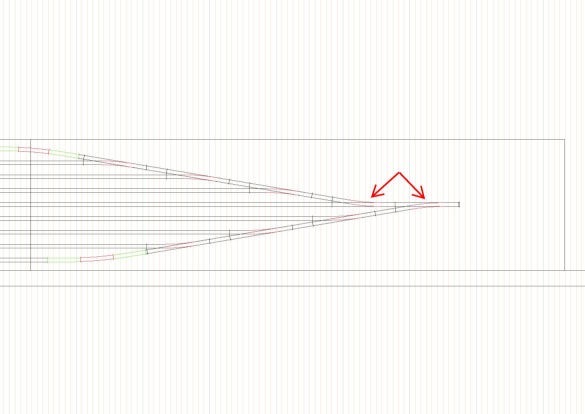 It doesn’t get fixed down until the straight stock rail on the right hand side is fixed in placed, then the frog is gauged off that rail. 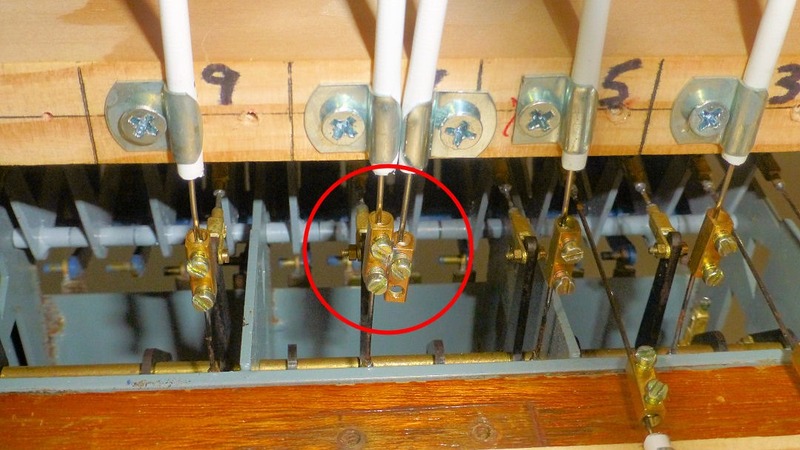 The picture above shows the second turnout partially complete. 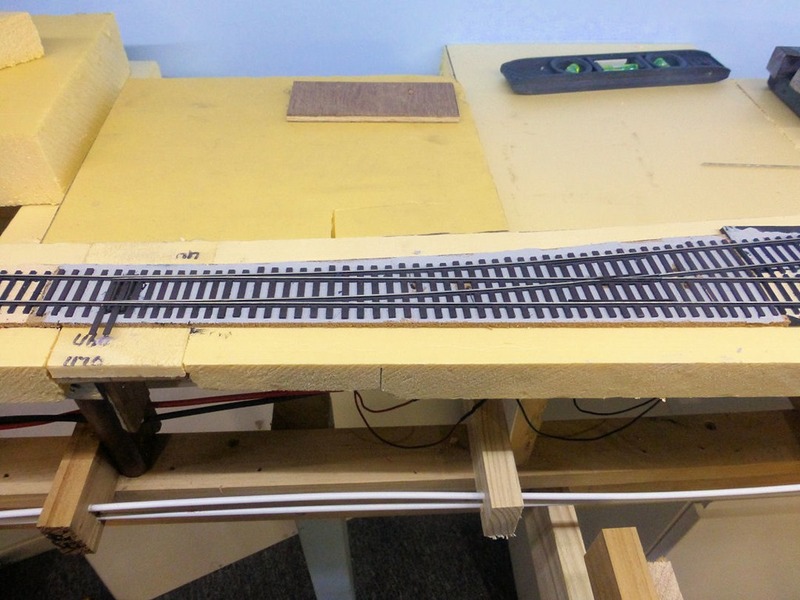 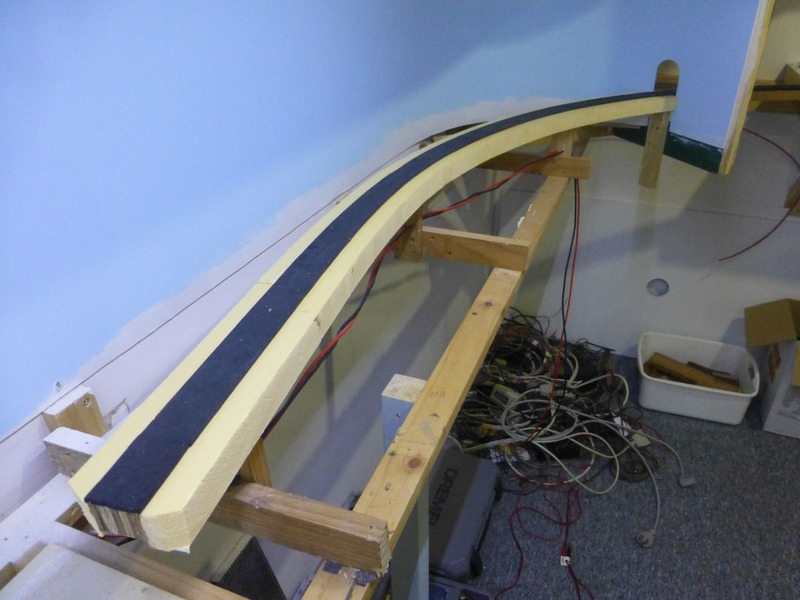 Both straight and curved stock and closure rails are in place as well as the frog. 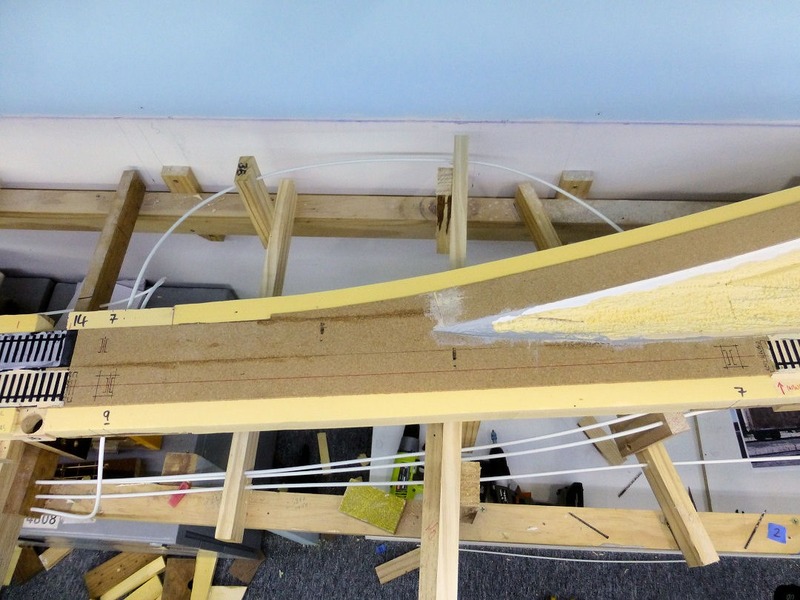 The point blades will be fitted later. 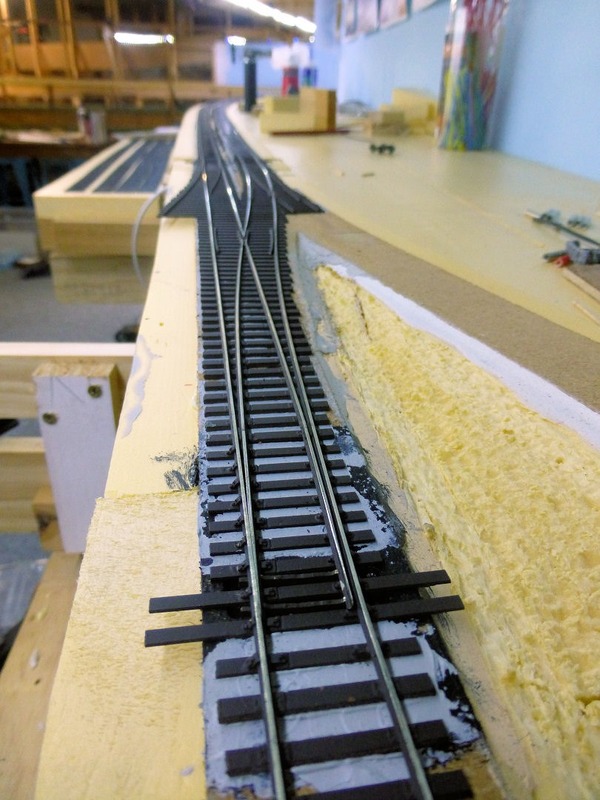 So, over the next few weeks, there will be more of the same happening until these first eight turnouts are complete, less point blades, and the rest of the tangent track in each UP road laid close to the end of the UP yard where another eight turnouts will be built. 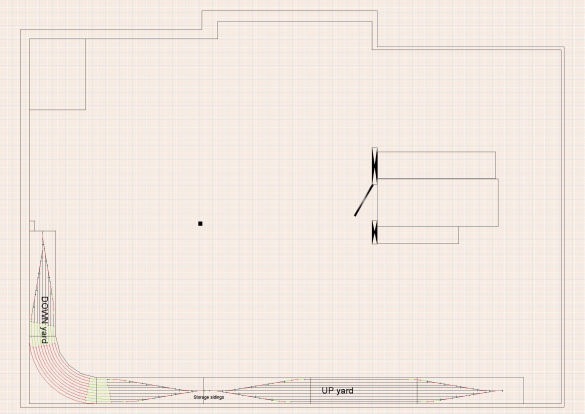 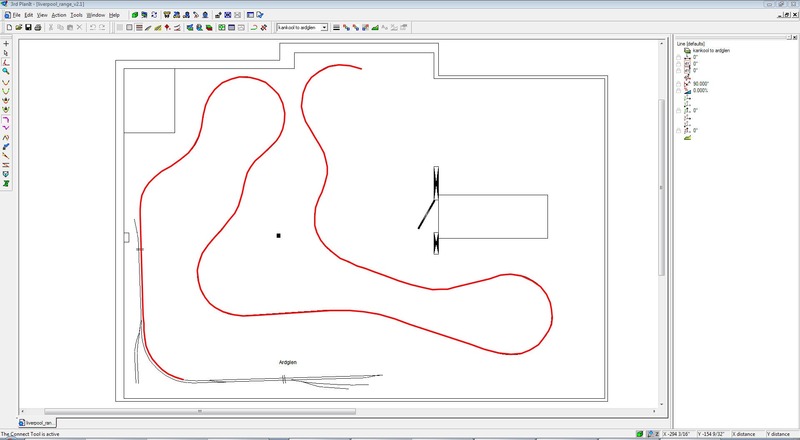 Here is a drawing showing the final arrangement of the storage yards.